An interesting story of a sister's betrayal. Roy Kingsmill (Olivia De Havilland) is a very happily married woman. What she does not know is that her husband Peter is not happy. In fact he is in love with her sister Stan (Bette Davis). Peter and Stan run away together and marry once the divorce from Roy is complete. This devastates the family - especially their Uncle William (who is inappropriately close with Stan) and Stan's fiance Craig. As life moves on Roy and Craig begin to spend more time together and begin a courtship. They decide that they want to be together and will be married one day. Then the phone call comes from a friend of Stan's that Peter has killed himself and Stan is devastated. Roy, being the good sister, goes to Stan and brings her back to the family home. When Stan realizes that Craig now loves Roy she decides to fight to get Craig back. In the process she is involved in an accident and wrongfully points the finger at a clerk in Craig's law firm. Now will the family be able to convince Stan to do the right thing or will her selfish ways win out again. This was an interesting movie. Davis and de Havilland were wonderful as they always were. Also wonderful was Ernest Anderson as Parry, the clerk wrongfully accused by Stan. This is an interesting movie that makes you think about what you would do if your family betrayed you in the same way. 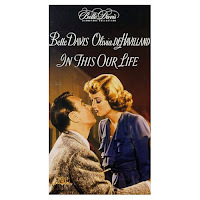 It is coming out on DVD in the next Bette Davis collection in 2007. This is a good movie to watch when your family drives you nuts because you realize how bad it could be.